Here we are going to share latest women wear winter bridal collection name “Heritage Bridal” 2019 collection. As we all know that recently Republic womens wear winter bridal collection lunched in Pakistan. This winter Heritage Bridal collection is containing amazing winter dresses for women with cute styles. In this winter bridal collection we can easily see luxury fashion dresses for women. Furthermore, in this bridal luxury fashion brand renowned for its intricately details and luxuries evening and bridal wear. Moreover, Republic womenswear winter bridal dresses are also well known by this amazing dramatic art. Heritage Bridal Wear Collection 2019 is containing amazing dramatic art of mixing of eastern and western culture in wedding dresses for women. So, in each bridal wear dresses by Republic womenswear we can seen beautiful trends with amazing ideas. In addition, Heritage Bridal wear dresses collection consisting of 4 amazing handcrafted dresses with stylish embroidery and modern styles. This winter Bridal wear collection is one of the most stylish collections presenting by Republic womenswear. Furthermore, all of these four bridal wear dresses were containing a different story or create by fashion sense. In this Heritage Bridal Wear Collection 2019 winter dresses were complete with heavy embroidery work of Zari and Tilla stones work on dupatta also. Moreover, with the heavy embroidered border or sparking with stunning hard work. In these beautiful bridal wear dresses, we can see multi-color combinations mix up with bright and soft colors. So, today here we have another powerful winter embroidery work winter bridal wear collection presenting by republic womenswear. So, this Heritage Bridal Wear collection is completely decorated with amazing bridal dresses that are presenting by growing bridal couture brand. We hope that you will like these amazing wedding dresses that are introduced by Republic womenswear for wedding functions. 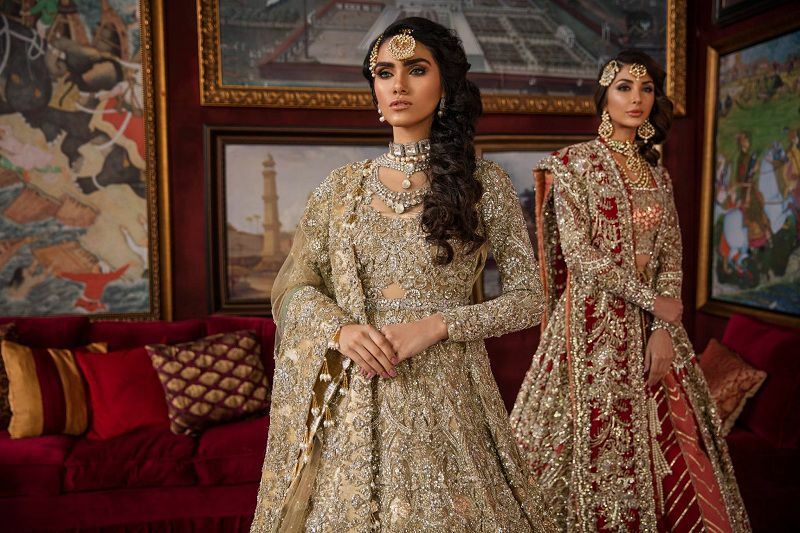 Here you will find the latest Pakistani bridal wear dresses trends, like HSY, Nomi Ansari, Asim Jofa, Zainab Chottani, Deepka Perwani, and Fahad Hussayn. So, just daily update our website home page and stay up to date.